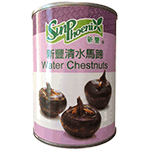 Water chestnuts are very crispy, sweet, healthy and ideal for desserts, soups and stir-fries. The water chestnut is a tuber vegetable that resembles a chestnut in color and shape. They have a unique nutty flavor and firm, crisp texture, making them a gourmet delight when eaten raw or used as an ingredient in stir-fries, salads, or any meals where the vegetables to be used need a crunchy consistency. Product of China.